“We did not think of the great open plains, the beautiful rolling hills, and the winding streams with tangled growth, as ‘wild’. Only to the white man was nature a ‘wilderness’ and only to him was the land ‘infested’ with ‘wild’ animals and ‘savage’ people. To us it was tame. It’s spring and the newborns are out. At one time, this scene would have been common throughout the Western plains, one more turn in the cycle of life. 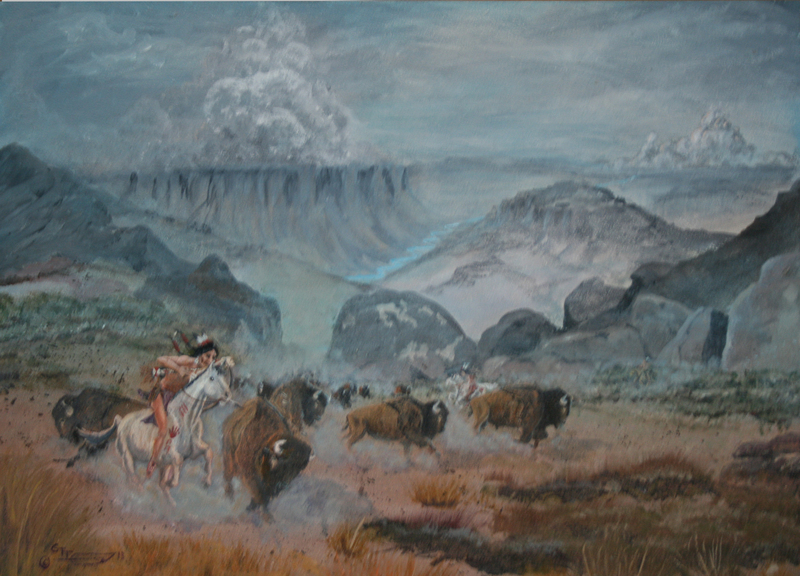 And then came the near extinction of the buffalo, and this scene became less common; a cause for celebration as conservationists, ranchers and others worked to preserve the buffalo herds. I love that this image could be one from the past, as well as the present, as buffalo herds grow and once again roam the prairie. Nature doing what nature does. I suspect that every artist, whether painter, illustrator or even musician, has faced the dilemma of knowing exactly when a work is complete. Sometimes you step back, look at the finished piece and you are happy – the story you want to tell is there. 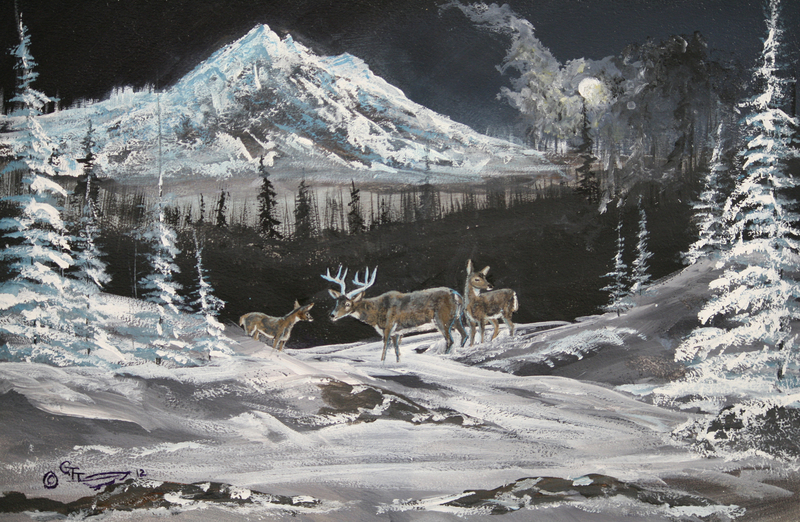 Other times, as with this painting, you just don’t feel it, put it aside and rework it again. 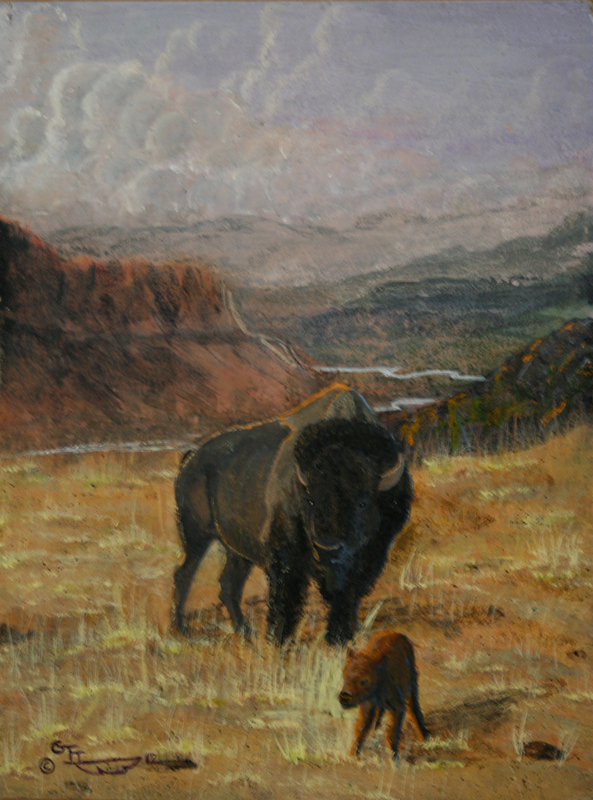 In the original version of this painting, titled “Storm over Buffalo Gap”, I wanted the viewer to see that both hunter and nature challenged the buffalo. Something about it bothered me though, it just didn’t quite tell the story I wanted. 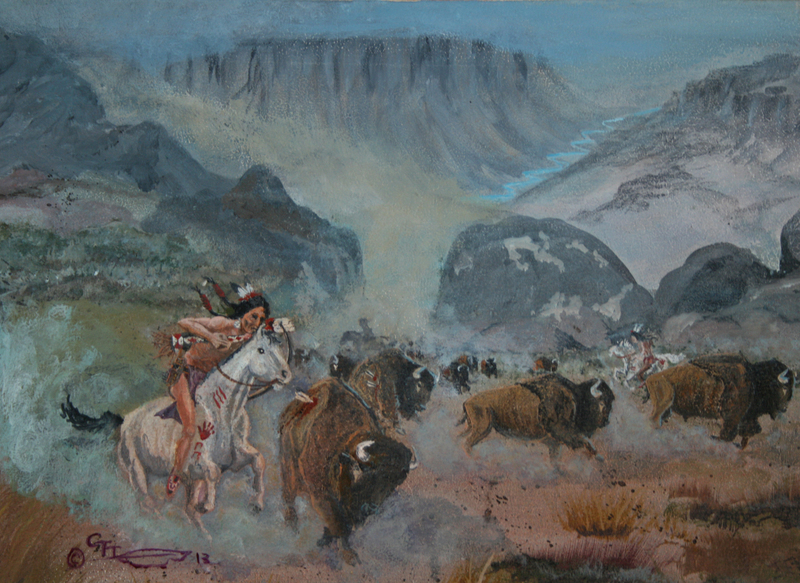 In the final version, titled “Ambush at Buffalo Gap” I brought the hunt closer to the viewer, making it a stronger focal point. The story captures the advantage of riding an experienced horse – the shot has hit its mark and the buffalo is going down. The scene is chaos, with buffalo heading in every direction, trying to avoid danger. One mistake by the horse or rider and it is the last hunt for both. Deadly fun for hunter, hunted and horse. I’m not completely satisfied, but I’m moving on, for now.